I know I have shown you the London eye before but it's dominance on the skyline makes you see it differently each day. With a blue sky as a backdrop it is very striking. Any one on this ride would have had a stunning view over London. Its so huge. Easy to see when you look at the people in the pods standing up looking tiny. The weather was never this clear on the days I stopped by to try it out. So alas, I still have not gone. I like the Eye, not only for the views but the amazing engineering feat too! 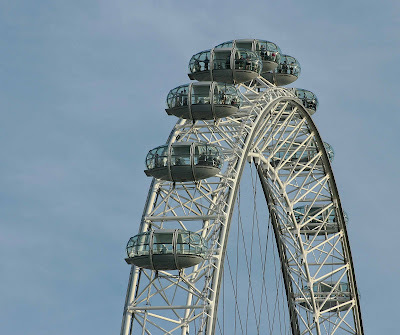 I love the London Eye! I wanna experience a flight in the dark! Have you ever tried shooting a photograph from within the Eye? Ah, yes! "Louis" saw the Eye over London when he visited St. Paul's.